Semi-permanent eyelash extensions are individual lashes (synthetic or authentic), that are applied to each of your natural lashes (not your skin), and adhered with an eyelash adhesive specifically formulated for use around the eye area. A properly trained lash stylist will place the extensions one-to-one on to your eyelashes so that when each lash sheds from your eye, it will not pull others off with it or cause any discomfort. This technique will not only make your eyelash extensions look and feel natural (without lumps and clumps), but it will also protect the health of your natural lashes. These eyelash extensions can last indefinitely with proper care and regular touch ups or “fills” performed every 2-3 weeks. Like the hair on your scalp, each hair grows in its own lash cycle, which is typically about 60 days. On average, humans shed between 1 and 5 natural eyelashes each day. Luckily, a replacement eyelash quickly grows in its place, thus the need for regular fills. 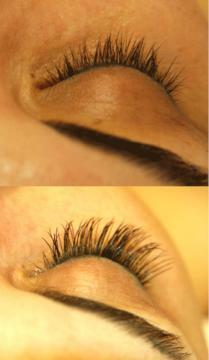 Please arrive to your lash appointments with clean, dry lashes, free of make-up and oils. Do not curl or perm your lashes within 24 hours prior to your appointment. Some clients find it irritating to have contact lenses on during the lash application. Please either arrive without contact lenses on, or bring a case and solution to store them during your appointment, and glasses for after if necessary. Full sets normally take about 2 hrs. So be prepared to get comfy while laying flat on a massage table. Also, it is advised to shower before your appointment as you cannot wet your new lashes for 24 hrs.